Well I promised way back in my Collection 2000 lipstick review that I'd be showing you all some of the summer looks I'll be trying this year. 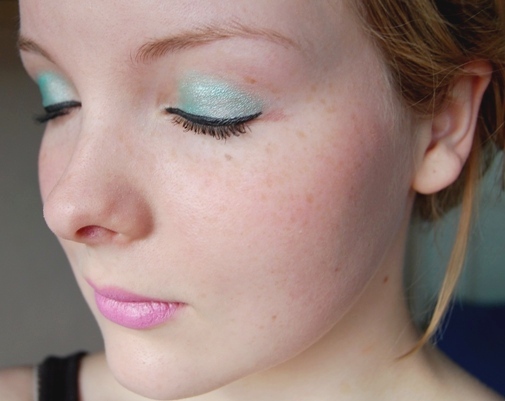 So, here is my first FOTD incorporating a few summer brights! On my lips you can see the 'bubblegum' Collection 2000 shade sealed with a little powder in all its matte glory. I can't resist a sweep of eyeliner and I think with my 'tousled' (that's the polite word) bun I wore my hair in today this look is almost 1960s in inspiration. However I couldn't resist making the most of that pastel lip and paired it with the mint green from my Accessorize palette. For a finishing touch I added some MUA shade 1 blusher just to add a slight pink flush to my face. Products used on my face were L'oreal Paris 16 hour foundation in porcelain, Collection 2000 cover up stick in light translucent, Collection 2000 pressed powder in ivory and MUA blusher in shade 1. On my brows I used MUA brow pencil in blonde and their mascara in shade 5. On my eyes I wore the palest shade and the mint green from my Accessorize eye wardrobe palette along with Rimmel Glam eyes lash flirt mascara and Collection 2000 fast stroke eyeliner in black. 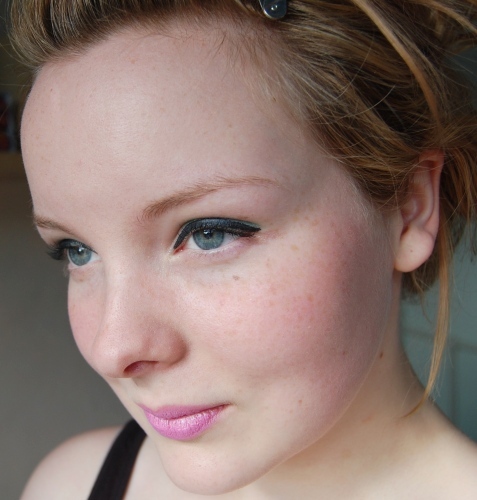 Finally, on my lips I wore Collection 2000 colour intense lipstick in bubblegum with a dusting of powder! @ArtDonatella Eee thank you, I've actually been struggling with my skin lately but it's good to know it's not that obvious! @Zoe For Collection 2000 I was SO impressed, it's a real gem. Oh my gosh! Love this, love your freckles, love the lip color! Awesome! @Kelsey Thank you! The freckles have turned up in abundance after the recent heatwave. @Grace Thank you so much! I have to say it is one of the best shades I've worn in AGES. Wow you are so beautiful... I agree your skin is amazing and these colours are gorgeous on you. Esp like the eyeliner. Would love to have seen the rest of your hair - loving messy buns atm! @Strawberry aww thank you :) and it was in dire need of washing that day but I might do some hair posts soon? @Summer Thank you! Since going blonde I've been trying out a lot more brights.